Am a movie buff a complete one. But not willing to sit and watch a boring movie to prove a point. I do watch any kind of movie though whether its action, romance, comedy or drama it just has to entuce me and hold me on to my seat. And most of all am not a movie critic as well, as i think its easy to sit and criticize rather than go and get the job done. 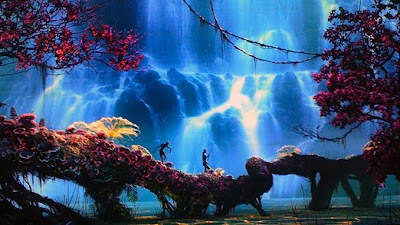 Last Saturday i saw this movie AVATAR (yes picked from hindu mythology for Incarnation) by James Cameron (man who yelled out "am the king of the world" when TITANIC won the Oscars). With lots of expectation i reached at the theater grabbed on to the 3D glasses and anxiously waited like a baby for the movie to get started. This movie is an epic and for the movies sake there is so much in the plate for the viewer to watch, understand, learn and feel. It was like on a daily dose of Daal-Chaaval somebody pushed an epicure to a World Food Festival Buffet. Picturization at its helm thats what caught my eye. Its more like James Cameron had a dream and he somehow downloaded all those into a Cinema.And the added note of the movie is the casting, very carefully Cameron has rallied some old troops and some fresh faces as well. No big star so as to speak of , and the real star is CGI which catches every ones eye by its breathtaking aura. Yes, the movie is a bit long (160 mins is not big for an average indian movie watcher) but i guess Cameron would have been in a confused state at the editing table on what to chop off? I couldnt think of a place which could be avoided as such all scenarios were carefully placed and etched together. There is a new dimension in movie making and movie watching experience. Dont miss it, it will blow you away by all means!!! !